The Shrine of Remembrance Medal recognizes an individual or group that has made outstanding contributions to the advancement of community knowledge and understanding of the service and sacrifices made by Victorians for their country in times of war and peacekeeping. The above list is not intended to be an exhaustive. On the evening of Wednesday November 10, 2010, I was amongst the five selected finalists, and at 10.30 PM was declared the winner for this year. I was completely overwhelmed to be accorded this honour. Entering the Royal Australian Naval College in 1936 as a 13 year old Cadet Midshipman. Lieutenant Commander Mac. Gregory RAN. Retired, spent all of the Second World War at sea. Following his service career he has maintained an active awareness of Naval matters. Today his main objective continues to be the promotion, education, and preservation of Australia's Naval Heritage. dedicated to Naval Heritage (Ahoy Mac's Web Log, URL: ahoy.tk-jk.net) and he also founded The Naval Heritage Foundation of Australia Inc.
Mac Gregory recipient of Shrine of Remembrance Medal for 2010. 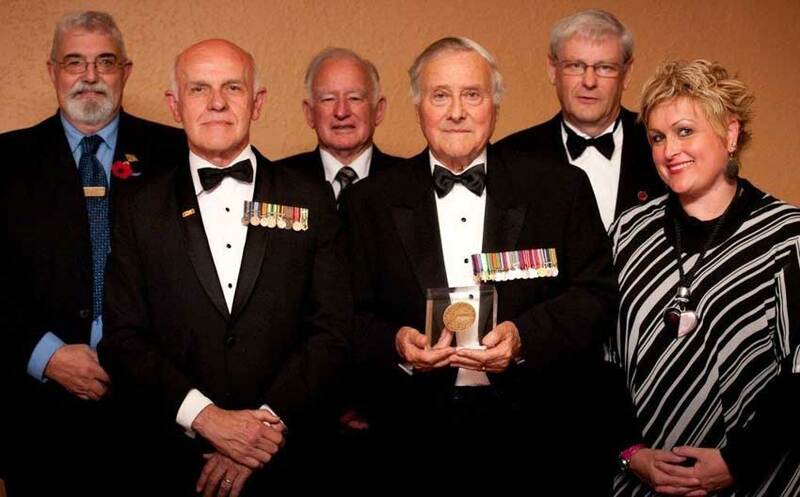 Finalists for award of Shrine of Remembrance Medal for 2010. From Left to right. Representative from Morwell RSL Military Education Unit, Neil Smith, Second representartive from Morwell RSL Military Education Unit, Mac.Gregory, Robin Mawson, and Fiona Jamieson.